On 14th November 2018, Perkbox accomplished something magical. 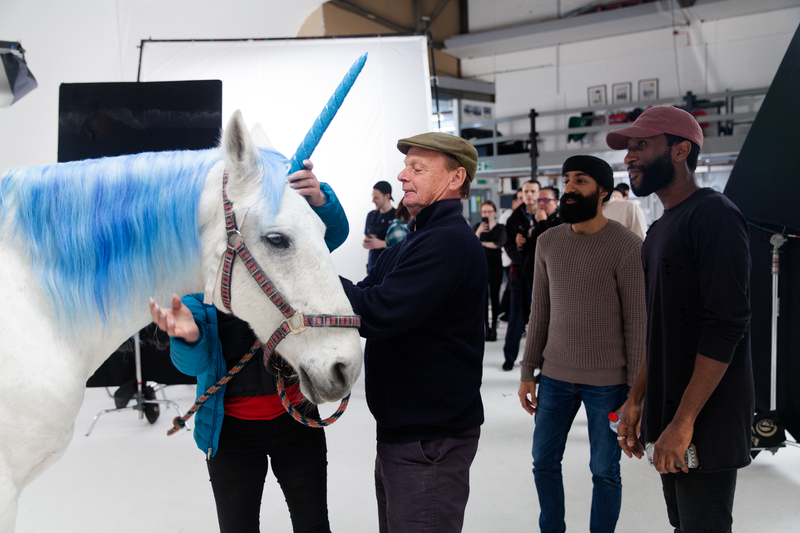 We filmed ‘The Best Boss’ – a social media video advert featuring one very enthusiastic manager, a team of hard-working employees, and, oh yeah, a unicorn! It’s not every day you meet an animal with a more impressive CV than your own. But our leading man Rusty has played the lead equine roles in everything from Robin Hood, to Beauty and the Beast. 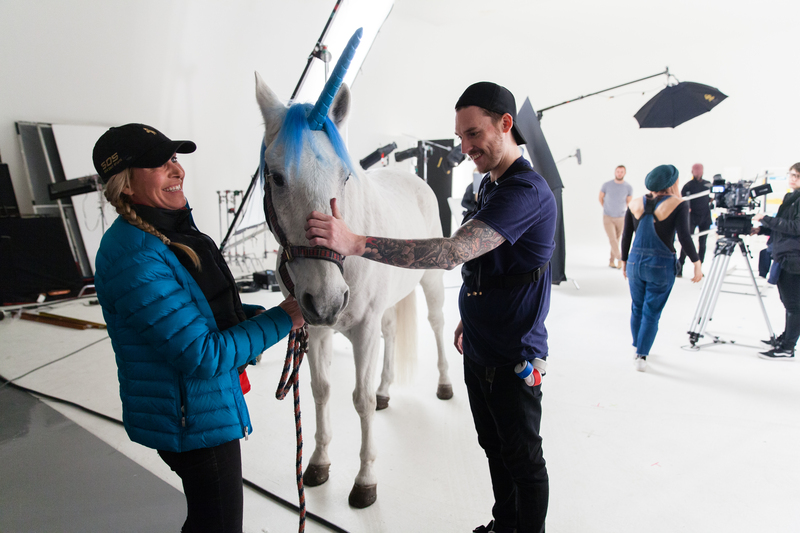 You might be wondering how we helped him transform into a Perkbox unicorn for a day. Well, you’re about to find out – straight from the horse’s mouth! ‘The Best Boss’ is inspired by life at Perkbox. Our aim was to depict the kind of fun, supportive environment we’ve come to know as employees. The Boss character embodies the company culture we strive for. She wants to empower her team to do their very best – and she would go to extraordinary lengths to make sure they feel appreciated. Our team thought long and hard about the most extraordinary gift a boss could summon for their employee. 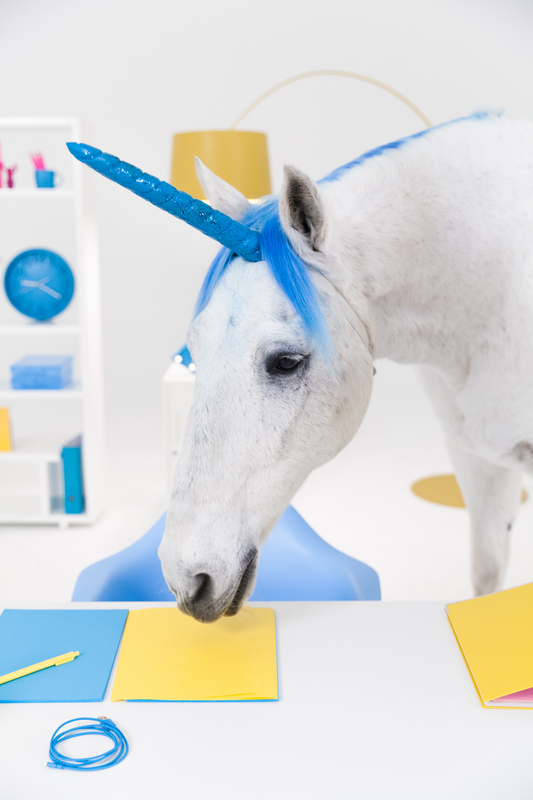 After much debate, we settled on that most mystical and graceful of creatures – the unicorn. I mean, who wouldn’t want to work in a company where you could win a unicorn by landing a sale? Guaranteeing the horse’s safety and comfort on the day of the shoot was absolutely paramount – which is why we we're so grateful to have connected with Steve Dent Stunts! Based just 15 minutes away from the renowned Pinewood studios in Buckinghamshire, Steve’s family-run company has enjoyed over 30 years in the biz, and looks after more than 80 horses trained for TV & Film. There was one performer who stood out from the herd: a friendly, snow-white male named Rusty. I’m told he’s either ‘14 or 15 years old’ and counts Russell Crowe among his Hollywood friends. It’s easy to see why he’s led such a prolific career. From the moment he set hoof in the studio, to the moment we wrapped up, Rusty was a total professional. ‘He loves his job,’ says Rusty’s handler Sandra. ‘Rusty thinks everyone’s here to see him. This is just another day at the office.’ Erm, quite literally. 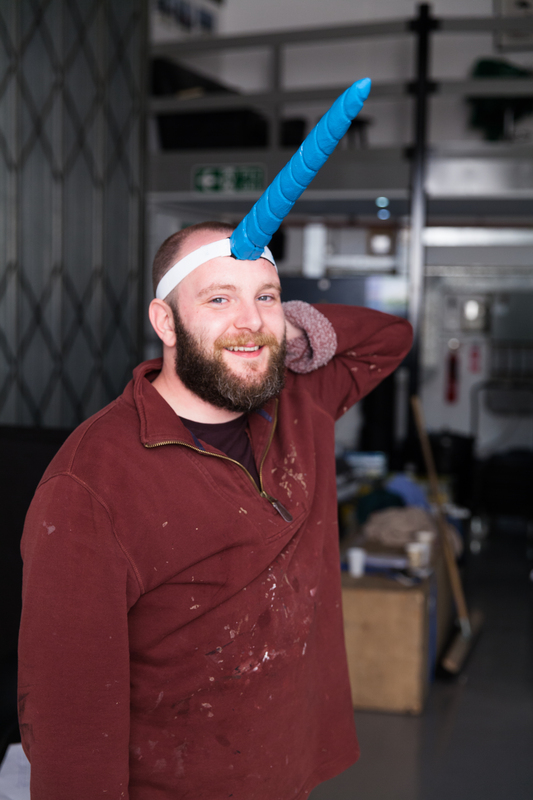 When you think unicorn, you think horn – so we knew Rusty's one had to be special. Lucky for us, Art Director Timothy Elisha-Lambert and Production Designer Simone Serlenga fashioned a fabulous prosthetic from lightweight styrofoam material. This isn’t just a unicorn. This is a Perkbox unicorn. For maximum impact, we decided to match the colour of Rusty's ‘horn’ and mane to the classic Perkbox blue. 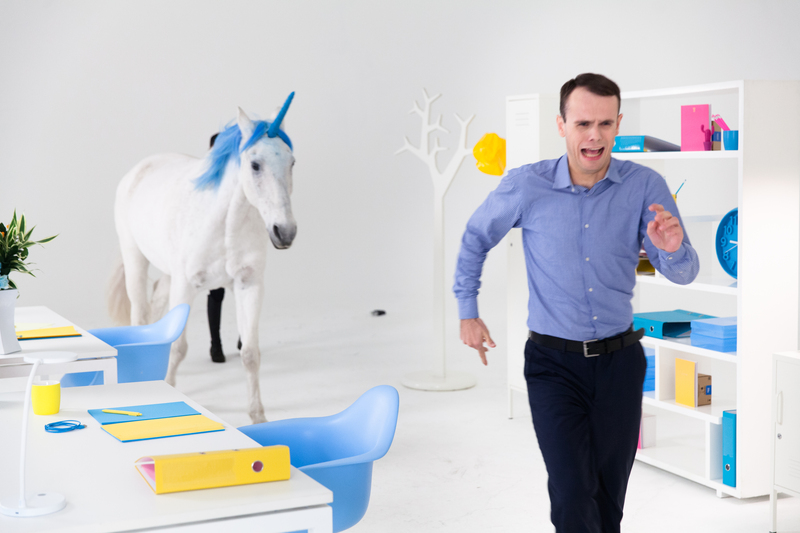 In the script, the unicorn’s big moment involved him getting a bit over-excited and chasing an employee through our office-style set. To film this set piece, director Sandeep Gill had Rusty and Sandra stand at one end of the set, while Steve Dent waited on the other side with a bucket of horse feed. When Sandeep shouted ‘Action!’, our actor started running. Sandra then released Rusty, who promptly trotted toward Steve. 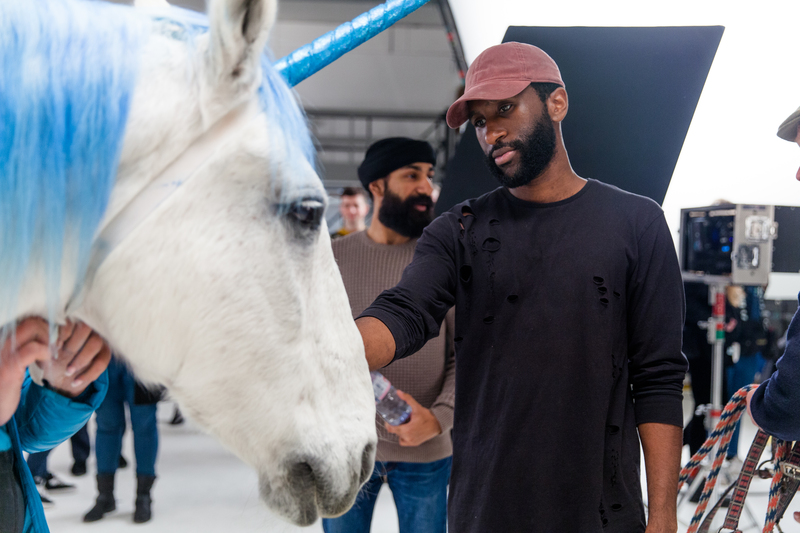 Although our actor’s ‘fear’ is very convincing as the unicorn chases him – the only thing Rusty was after was the delicious snack awaiting him on the other side of the set! What's more fun than a good scare?